LONDON, England (CNN) -- Despite the fact that some of the effects of climate change are still imperceptible to all but the most highly trained eyes, there can be no doubting the alarming picture painted by glacier melt. The iPhone application includes audio, video, slideshows and a documentary film. As these rivers of ice retreat back up the valleys they carved out, so scientists' knowledge of climate change advances, in turn helping us recognize the signs of a warming world. Now a new iPhone app is helping visitors to the Swiss Alps understand how climate change is altering the landscape. Developed by the Oeschger Center for Climate Change Research at the University of Bern in Switzerland and Swiss software company, Texetera, the Jungfrau Climate Guide is an interactive guide to glaciers and climate change. 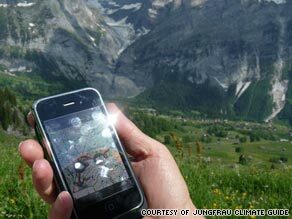 For a fee of 20 CHF (around $19) visitors to the Jungfrau Alpine region can hire an iPhone loaded with the app. Kaspar Meuli, Head of Communications at the Oeschger Center, told CNN what people can expect from the device. "There are many different levels to the application. Audio pieces -- like the ones you might expect to find in a museum guide which guide you through paths on seven different trails." At different stages along each trail, the phones -- aided by the built-in GPS -- alert visitors to particular points of interest by sounding a yodel. "For example," Meuli explained, "if you are standing in front of a glacier you will be told why it is no longer as big and provided with images of what it looked like 100 years ago, and what it might look like in the future." There are more than 40 audio guides, plus a range of multimedia offerings including videos, slide shows and a documentary film. There are also sections which describe the various flora on the trails along with information on biodiversity. "Everyone who tries it is quite fascinated by it," Meuli said. "People are realizing that climate change is real when they see the consequences." The Jungfrau region is home to the upper and lower Grindelwald glaciers, which have retreated rapidly in recent years. In 2008, the World Glacier Monitoring Service reported that glaciers in some regions of the world were melting away at a rate of more than a meter a year recently. Responding to the 2008 report, Achim Steiner, Executive Director of the U.N. Environmental Program, said: "Millions, if not billions, of people depend directly or indirectly on these natural water storage facilities for drinking water, agriculture, industry and power generation." "There are many canaries emerging in the climate change coal mine," Steiner added. "The glaciers are perhaps among those making the most noise." In the future, Meuli says the University hopes to produce features that can be used by teachers in preparation for taking classes to the glaciers.